The votes have been counted and the winners have been identified. Congratulations to Saline Parks and Recreation for their FIRST PLACE winning entry. 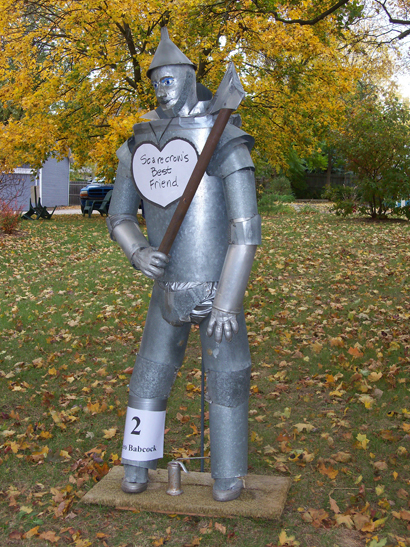 SECOND PLACE goes to Leo Babcock and his "Tin Man" entry. A special mention goes to Kevin John (yes one person, not two) for his fourth place entry - an excellent pvc skeleton creation - greatly admired by the chiropractic hosts. Scarecrows could be entered as an individual or by a group, organization or business. Interestingly, the order of the arrival of the scarecrow correlated with the number of votes received, with the first place winner having arrived and been in place first receiving 8 votes, second place vote getter arrived second receiving 4 votes and the third place vote winner arrived third and receiving 2 votes. So timeliness may be something to think about for those who may be planning on entering next year's contest. 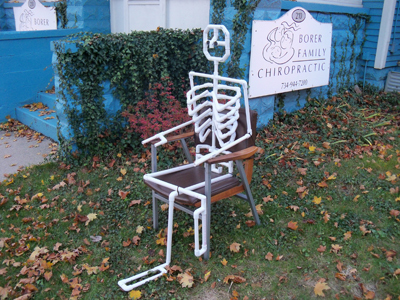 Check the Borer Family Chiropractic website starting in September for next year's contest. We would like to thank all responsible for the 4 entries that have made our front lawn and the west side of Michigan Ave in Saline so festive this fall. 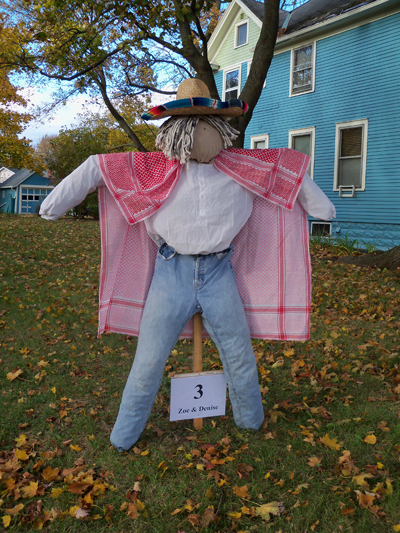 We would also like to thank everyone that voted for their favorite scarecrow. And we certainly want to acknowledge all of the sponsors who made entering and voting a rewarding experience. Everyone that entered the contest as well as voted in the contest received a special treat from one or more of our generous sponsors. Dairy Queen donated free ice cream cones. Benny's Bakery donated your choice of a cookie, a donut or a pretzel. And Busch's donated a free carmel apple. Yum! All prizes will be mailed out this week - so watch your mailboxes and then enjoy! Thanks for taking part this year - tell your friends to join in next year. 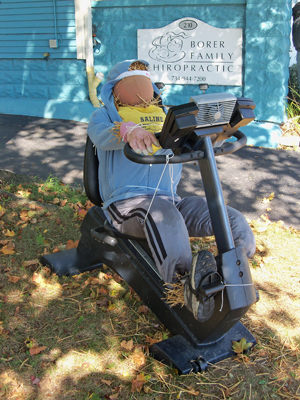 All entries can be seen on facebook as well as on the Borer Family Chiropractic website.